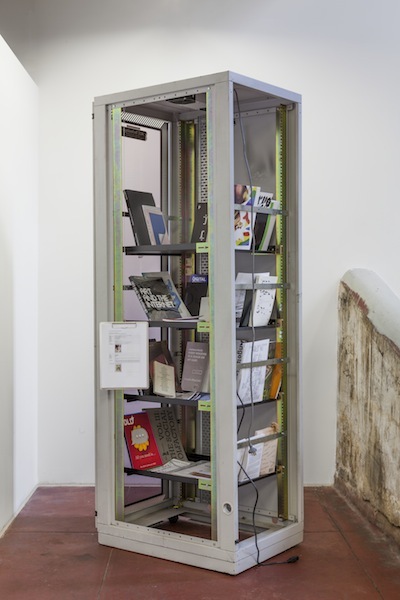 Alana Kushnir, Tabularium Archive, (2014–), publications with an online ethos that are unavailable in digital form. Photograph: Christo Crocker. 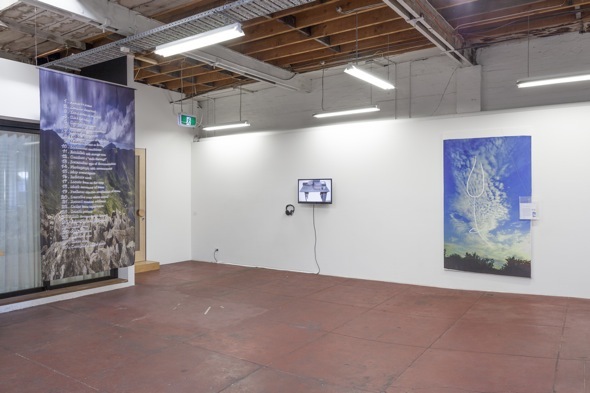 Left to right: Eloïse Bonneviot, My Forensic Steps 2, (2014), digital print on silk. Heman Chong and Anthony Marcellini, Twenty Plots for Things To Come, (2013–present), online film, unknown duration. Ry David Bradley, Flowers for Ukraine (2014), ink transfer print on suede. Photograph: Christo Crocker. Anthony Marcellini and Heman Chong's Twenty Plots for Things to Come pre-emptively eulogises knowledge. From a counter position to Tabularium, the website/video recycles and displays images from science and technology museums, playing them in random sequence until the original image links die. I feel like I am walking around inside an install shot. The works are beautiful; they are also cool, light, tech, premium, and optimized for the screen. Ry David Bradley, Flowers for Ukraine (2014), ink transfer print on suede. Photograph: Christo Crocker. You don't need to remember anything because Wikipedia exists, Ry David Bradley knows this. Wikipedia won't remember the 10 hours that David Bradley's delicate tulip was the picture for Ukraine. You don't need to know what Simon Denny's show looked like. You just need to remember Amalia Ulman and Simon Denny. Perhaps Tabularium resists the liquidity of user-edited personal branding, preferring static forms of accountability: books reserved for contextual irreverence and future hubris. 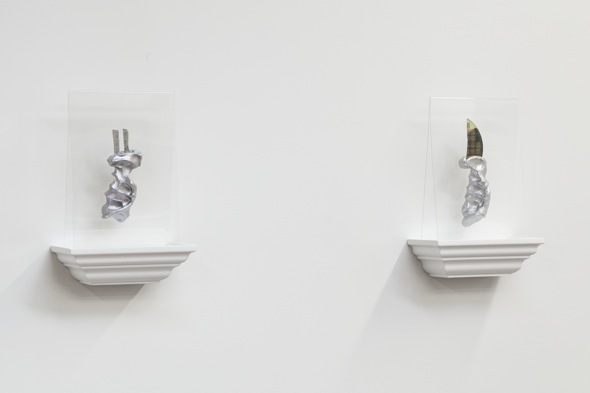 Katja Novitskova, Shapeshifter X, 2013 (left) and Shapeshifter V, 2013 (right), broken silicon wafers, epoxy clay, nail polish, appropriated acrylic case, appropriated wooden capital. Photograph: Christo Crocker. 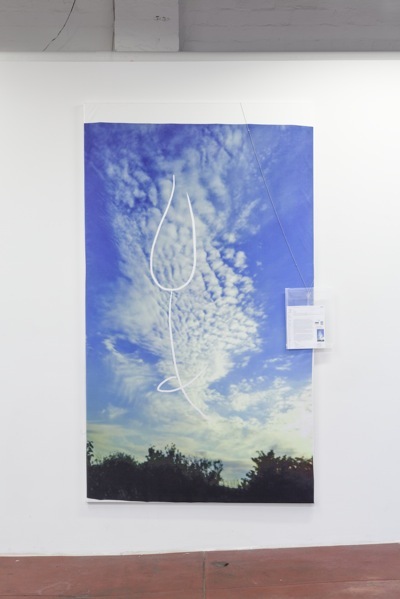 Katja Novitskova retroactively constructs an aura around unknown information. Shapeshifters takes broken silicon wafers and turns them into tools/weapons. Exhibited inside display cases on wooden capitals, they become museological cyber antiquities: semiconductor material manufactured to transmit information becoming information itself. Like maintaining web 2.0 currency or taking up space as a survival tactic, Novitskova builds her own myth. 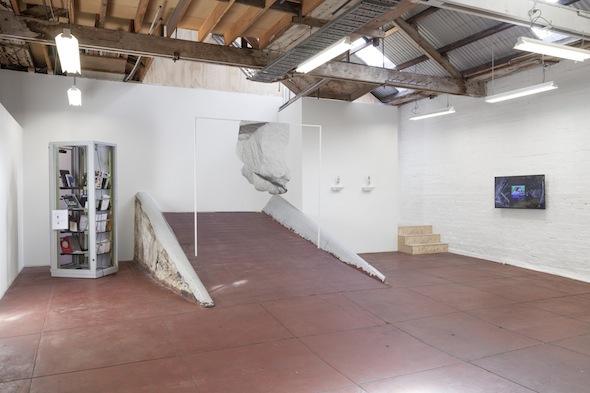 Displayed next to Rafman's Annals of Time Lost, both artists' works present a mythology of pointing signifiers. Rather than point at anything in particular, the works suggest a dissonance between historicizing information/materials/artefacts before vs after the internet. 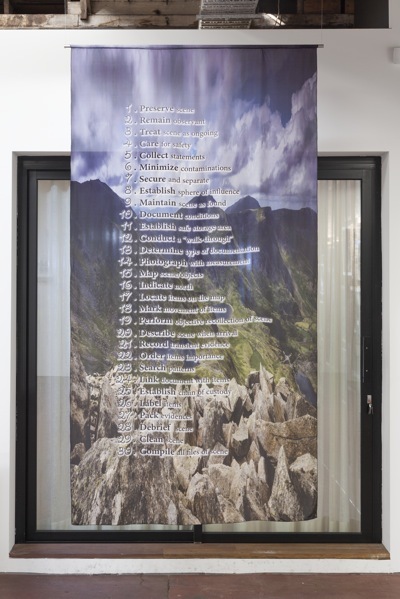 Eloïse Bonneviot, My Forensic Steps 2, 2014, digital print on silk. Photograph: Christo Crocker.